Both the 49th Battalion and the 101st Regiment were equipped with the Ross Rifle. The Ross Rifle was an excellent sporting and target rifle but it proved to be a highly ineffectual and unreliable weapon during the First World War. These slightly comic-opera incidents emphasize how remote the idea of war was in 1913. The training of the militia in Edmonton reflected the same assumptions. Both cavalry and infantry paraded weekly on a more or less regular basis. Winter parades were less frequent and less well attended because of the lack of indoor facilities that could accommodate drill and instruction during the cold weather. Prince of Wales Armoury was not completed until the war was underway, and, until then, various makeshifts were employed. Schools were used for lectures and courses of instruction. The 101st used Edmonton's largest indoor venue, the Thistle Rink, until it burned down early in 1914, destroying all the regiment's uniforms and equipment. Most of the training that took place involved musketry. Rifle shooting was a high-profile sport at the beginning of the twentieth century, and the militia participated enthusiastically in the competitions that led to the annual Bisley matches in England. Both the 19th and the 101st were equipped with the Ross Rifle, which, whatever its shortcomings as a combat weapon, was an excellent target rifle. 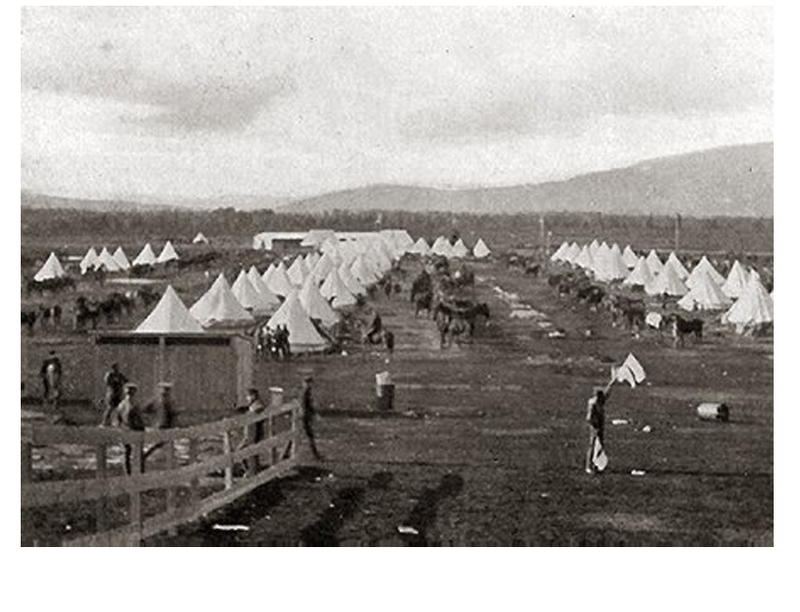 Military Training Camp, Calgary, AB, ca. 1914. Edmonton's soldiers had few chances to train before the war. The best opportunity came during the annual Calgary camps, which took place every year in late June. 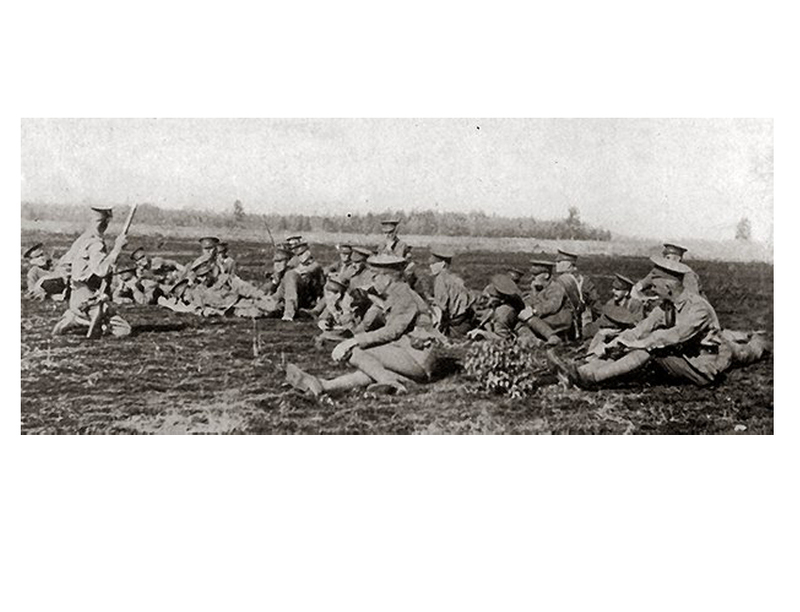 Although this training was productive, it was hardly enough to prepare the Edmonton regiments for active service. Except for the occasional ceremonial parade, the only time the militia trained at anything beyond the platoon level was during the annual Calgary camps in late June. Here, units from across the military district would gather, usually 2,000 to 2,500 strong. 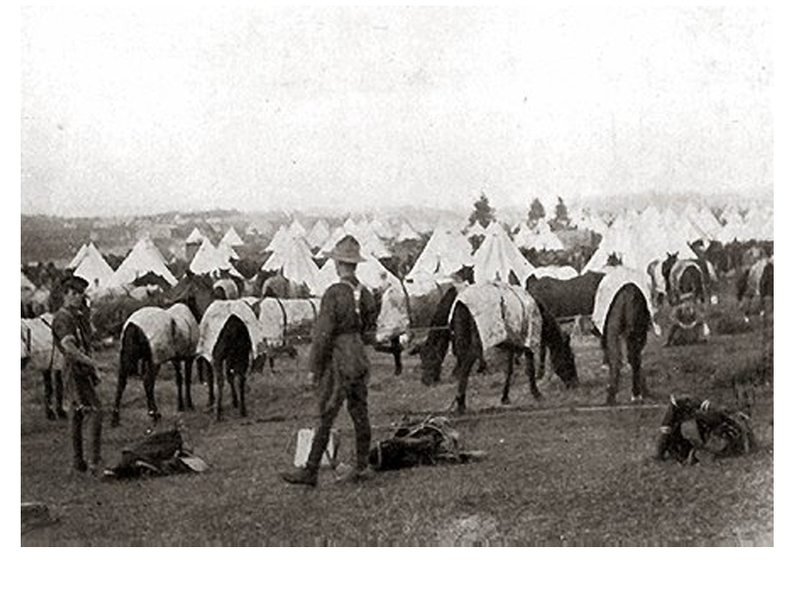 They lived under canvas and the infantry got a taste of working not just with the cavalry but also with signallers, engineers, and artillerymen. This training, however, provided no more than a taste: the cavalry spent only two weeks in camp and the infantry just a week. The militia camps were fun for all; beyond the allure of living outdoors in the shadow of the Rockies in high summer, the men enjoyed the camaraderie and the entertainment, such as bands, that was provided for them. Even the food was all right. In terms of getting ready for the coming war, however, militia training was rather like preparing to run a marathon by doing a few sprints once a year. 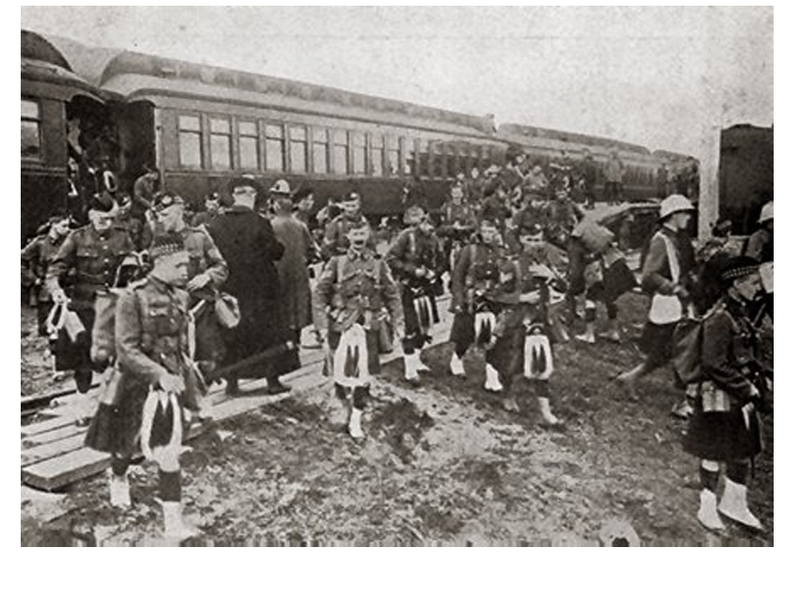 Canadian Highlanders Regiment Detraining at Mobilization Camp, Valcartier, QC, 1914. Lord Strathcona's Horse, Valcartier, QC, ca. 1914. Soldiers from the 2nd Battalion, Valcartier, QC, ca. 1914. Royal Canadian Dragoons, Valcartier, QC, ca. 1914. On the Ranges, 90th Rifles (8th Battalion), Valcartier, QC, ca. 1914. Thomas H. Russell, Europe's Greatest World-War (Toronto: J.L. Nichols, 1914); Mary Plummer, With the First Canadian Contingent (Toronto: Hodder and Stoughton, 1915). 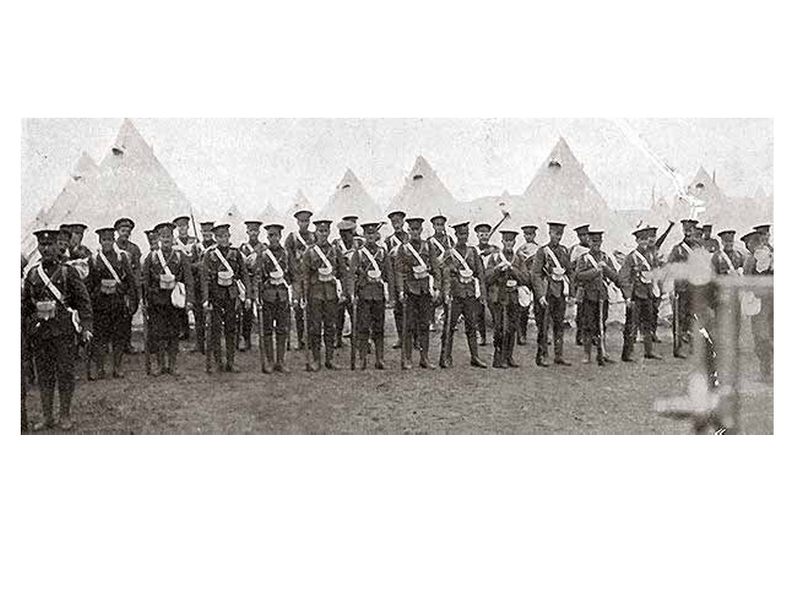 The mobilization and initial training of the Canadian Expeditionary Force was a shambles. This situation was largely due to the arrogance and erratic tendencies of Sir Sam Hughes, the Minister of Militia and Defence. Hughes ordered that training would take place at a new facility, Valcartier, instead of at the pre-existing facility at Petawawa, Ontario. Valcartier was miraculously made ready in time for training, no thanks to the impulsive Hughes. Gas Gushing from a Well, Turner Valley, AB, June 1914. In 1914, the discovery of oil at Turner Valley, south of Calgary, was one of the many news stories that diverted Albertans' attention away from increasing political tensions in Europe. Of course, as late as June of 1914, nobody really expected a major European war. In the House of Commons that month, the Liberals criticized the Prime Minister Robert Borden's government for overspending on the militia. (13) War news appeared on the front pages of the newspapers in the spring of 1914, but it came from Mexico where civil conflict was raging and American marines were intervening. Many other dramatic stories served to distract readers from the ominous rumblings in central Europe that spring. Irish Home Rule and the possibility of a mutiny in the British Army vied with the "outrages" (the editors' favourite term) of the suffragettes for public attention. The sinking of the Empress of Ireland in the St. Lawrence River in May was second only to the Titanic tragedy in lives lost in a passenger ship accident, and June saw the Hillcrest Mine explosion in southern Alberta, the worst disaster in Canadian mining history. A sensational investigation of corruption in the Edmonton's police force dominated the local news. On a happier note, the first significant oil discoveries at Turner Valley filled the newspapers with share offerings and the prospects of easy wealth. The baseball exploits of American Ty Cobb, the star second baseman of the Detroit Tigers, filled the sport pages. On 28 June, the heir to the throne of Austria-Hungary, the Archduke Franz Ferdinand, and his wife were assassinated in Sarajevo, Bosnia-Herzegovina. The press reported the event the next day, but coverage was quite low key and the story disappeared from the newspapers after a few days. The public was generally uninterested. The reaction of Sholto Douglas, an Oxford student finishing his first year of university, serves as an interesting example. Douglas, soon to be an artillery officer, fighter pilot, and eventually Marshall of the Royal Air Force, noted that "there appeared in the newspapers a report of yet another incident in the tiresome Balkans." (14) His reaction was absolutely typical, even among European diplomats and professional military men. The Balkans had been in a state of constant turmoil for over a decade without producing a wider conflict. Why should this incident be any different? 13. Ibid., 2 June 1914. 14. Sholto Douglas, Years of Combat: The First Volume of the Autobiography of Sholto Douglas, Marshall of the Royal Air Force Lord Douglas of Kirtleside (London: Collins, 1963), p. 39.